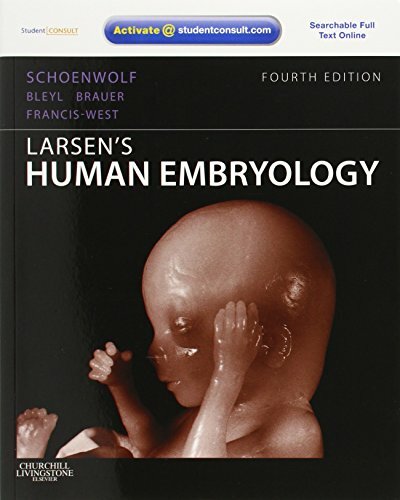 [PDF] Larsen's Human Embryology, 4e (Schoenwolf,Larsen's Human Embryology) | Free eBooks Download - EBOOKEE! Description: This book presents in-depth coverage of both the clinical and molecular biological aspects of human development. It examines the relationship between basic science and embryology, and describes potential clinical disorders arising out of embryologic problems. A strong clinical focus, practical design, and superb artwork-with more than 150 images new to this edition-allow for quick comprehension and easy application of the latest knowledge in this rapidly advancing field. A user-friendly design enables you to review the material in several ways, and online access to Student Consult enhances your study of the subject and exponentially boosts your reference power. Follows a user-friendly design allowing students to review material in flexible ways and instructors to tailor the book to their specific needs. Reflects the most current advances in molecular biology and genetics. Offers chapters with illustrated timelines of the relevant embryologic stage. Contains a high-quality full-color art program, with excellent line diagrams with a three-dimensional aspect, many color photographs of clinical disorders, excellent black and white electronphotomicrographs, and line drawings showing sequential stages of development. Presents clinical cases in each chapter that place the content into a real-life context. Begins each chapter with a summary providing at-a-glance reference to key information. Features Clinical Tasters following the summaries at the start of each chapter that present a clinical case example related to the material for that chapter. Offers new chapters covering morphogenesis and dysmorphogenesis, for expanded explanations of the making of an embryo, focusing on cell-cell signaling pathways. Emphasizes important content through clinical (In the Clinic) and research (In the Lab) boxes - many new to this edition. Concludes each chapter with lists of references for further in-depth study. Includes access to Student Consult at www.studentconsult.com, where you'll find the complete text and illustrations of the book online, and fully searchable . "Integration Links" to bonus content in other Student Consult titles . 200 USMLE-style questions to help you assess your mastery of the material . embryology animations that bring the topic to life . and much more! No comments for "[PDF] Larsen's Human Embryology, 4e (Schoenwolf,Larsen's Human Embryology)".